Ah, the blouse we love them. We don’t miss any chance to make it look as stylish as possible. Why you may ask? Because, it can take your saree style to next level. Sarees are going to stay in the Indian fashion world forever. Women can never lose her charm to drape the 6 yards (in some cases 9 yards). Hence it goes without saying that we will forever look for best blouse designs to complement our saree. 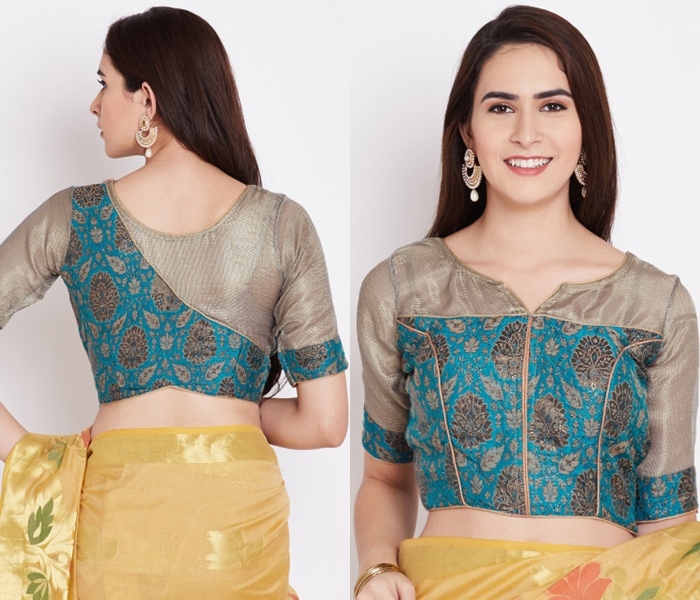 While the saree blouse can be made to look gorgeous in tons of fashion forward ways, often the simplest way to catch the attention is by adding border details to the blouse back necks. 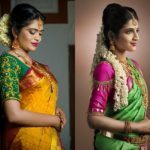 Considering the fact that the more visible portion of the saree is the blouse back neck, this area can be experimented in tons of way thereby achieving unique saree look each time. 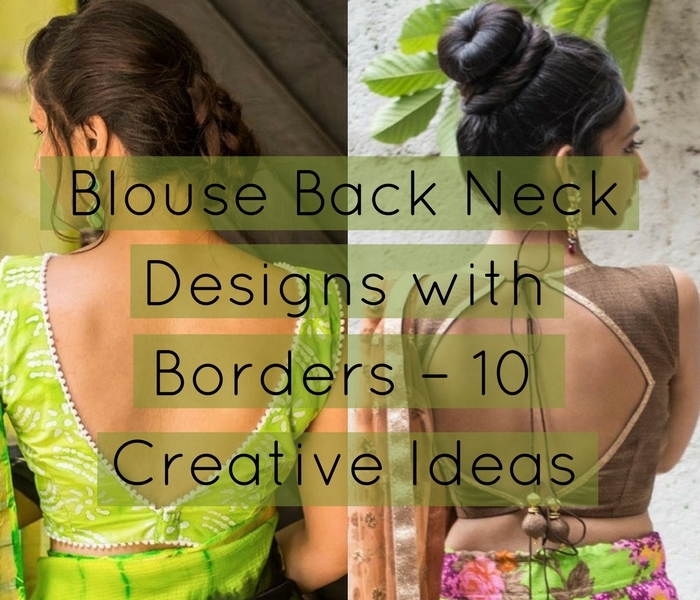 Today we have curated 10 ideas on how you can make your blouse back necks utterly striking by the addition of chic borders. Are you ready? Now scroll down to see all the hitherto unseen blouse back neck design with borders. Also Read : Rock Plain Sarees with Border: 26 Magical Ideas to Try! Borders are known to be added on the edges of blouse sleeves & necks. Break the norm and add a bold border all around the neck with fabulous cuts. Your blouse will sure to stand miles apart in the crowd. Instead of gracing your blouse back with thin lines or patches of border fabric, why not expand it and cover the whole half of blouse back between the most flattering geometric lines. The easy way to make your border define dimension on the back is to add layers of net fabric. Don’t go for the default route and add them on edges. Allow the net material to stand out in between the blouse back and on the hands. This is a sure way for a glammed-up blouse look. Probably, the most effortless blouse border idea is to add a simple zari cloth all over the edges. This is still an efficient way to make your blouse back attractive instead of leaving it plain. 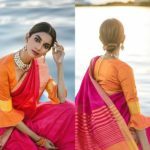 Next to net, tissue material can really change your saree style when they are intermixed with your blouse fabric properly. Need an inspiration? Check the fabulous stitching below. If you want to give a festive boost to your blouse, consider adding layers of embellished borders either on the plain back neck or netted back for more traction. We understand your shyness and your intention for keeping things simple. You are not left out. Don’t worry. Just ask your blouse designer to add a layer of piping on the blouse back. They are enough to infuse style quotient. Remember to choose attractive contrasting colors for piping to reap the whole benefit. If you love deep back necks, then to make it look more sassy, high light your dramatic backs with the sides stitched with contrasting borders as below. For a heavy festive look, invest on a zig zag border and add saree brooches in between for a delightful blouse style. With layers of Sequin-work borders, your blouse back is going to look all the more glittery and edgy. 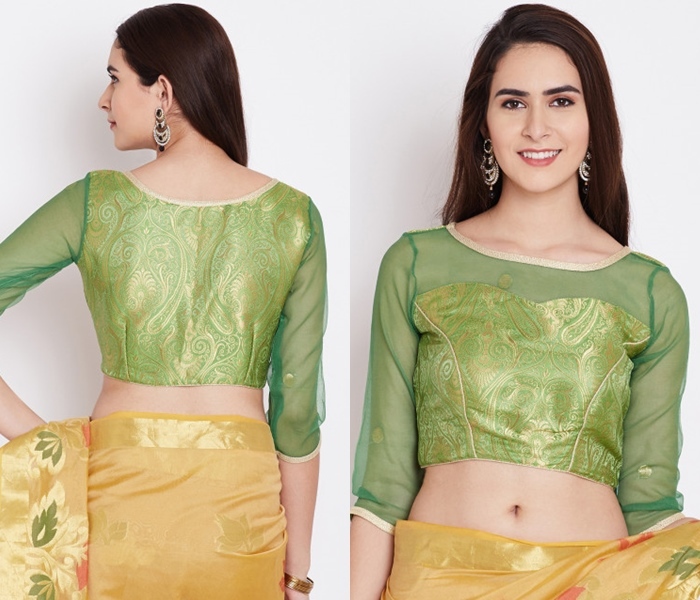 This is a perfect blouse back to make your designer sarees look a million bucks. Don’t under estimate the attention you can grab by your saree blouse. 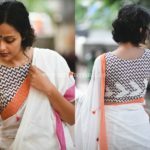 Try these border ideas on the back necks and make your saree style unique. 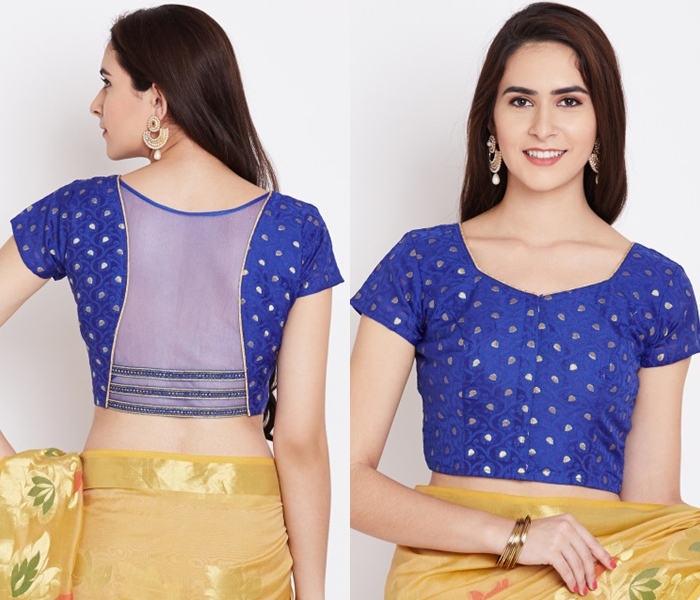 If you have other interesting blouse back neck designs with border details, do share it in the comment box below. We will add it to the above list. 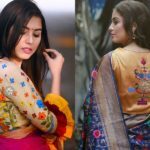 Also Read : Top 15 Saree Jacket Designs and Patterns of All Time! 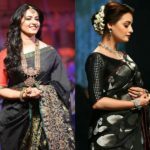 How to Shop the Best Blouse Designs For Your Black Saree?